Increasingly, homeowners are considering their deck as another room of their home. Can a Deck Hold a Hot Tub? A hot tub is a wonderful luxury that will likely get lots of use if added to your home. It’s especially nice if you want to enjoy your deck during the colder months. However, simply adding a hot tub is difficult. First of all, a hot tub is heavy. It is generally recommended that a hot tub be placed on a flat concrete slab. If your deck was not built with a hot tub in mind, there is a good chance that it will not be strong enough to support the weight. Further, the chemicals used to keep the water in a hot tub safe and clean can do a lot of damage to the wood of your deck. 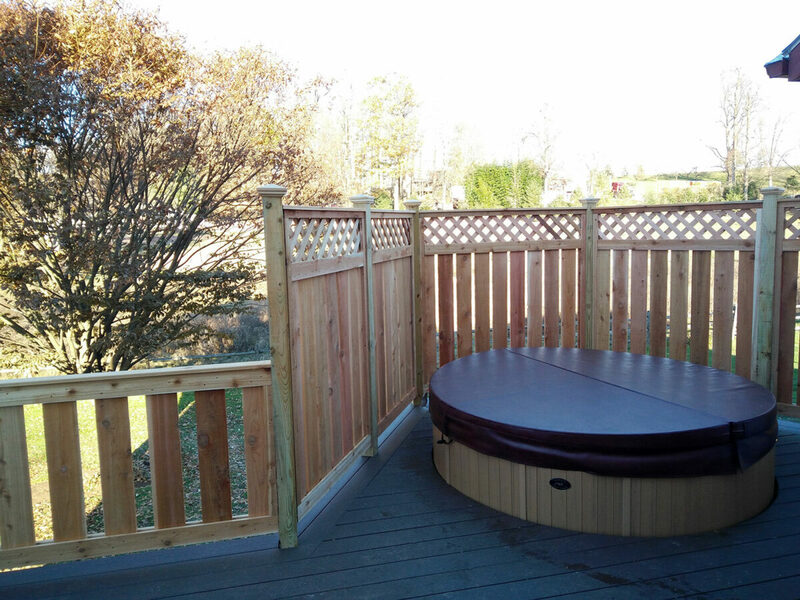 Therefore, it is best that you build your deck around your hot tub, using lumber and hardware that is designed to resist water and chemicals. Additionally, by building your deck around the hot tub, you will reduce the clearance for stepping into the hot tub. You can even add a small staircase to make it easier. Can a Deck Go Next to a Pool? Just like a hot tub, a pool is a wonderful addition to your home. And, like a hot tub, the chlorinated water can do a lot of damage to traditional wood decking. But again, with the right material choices, a deck can stand up to the extra water and chemicals. Composite is a great, all-purpose solution that is also affordable. With a little planning, a deck is the perfect way to maximize the enjoyment of your pool. Not only will this make getting into your pool easier, but it will also be a great place for the whole family to spend time, whether they are taking a dip or not! Can a Deck Hold a Fire Pit? A fire pit is a wonderful gathering place for families that want to spend time on their deck. However, you need to take certain precautions when installing a fire pit, especially if your deck is wood. First of all, place your fire pit in the center of your deck. You don’t want flames or sparks leaping from your fire pit and accidentally catching a railing, fencing, or even your home on fire. Second, don’t place the fire pit directly on the wood surface. Some fire pits are designed to ensure that this doesn’t happen. However, as an extra precaution, you should also place a layer of pavers between your fire pit and the wooden surface of your deck. Additionally, you should always keep a bucket of water nearby and never leave a lit fire pit unattended. Can a Deck Include an Outdoor Kitchen or Cooking Area? Outdoor cooking is all the rage these days. Whether people are installing outdoor pizza ovens or wet bars, outdoor cooking areas allow you to spend time outside while preparing food. The key is making sure that your deck is strong enough to hold whatever kind of outdoor cooking equipment you want to install. If it is a small grill, you are probably in good shape. However, if you are looking to install a full outdoor kitchen, you may need to find a way to either strengthen your deck or add to it to ensure that its structurally sound. Additionally, as with a fire pit, you want to make sure that your kitchen isn’t also a fire hazard. You should keep cooking surfaces far enough away from vertical structures so that the heat doesn’t cause a fire. Even if you don’t end up burning your house down, there have been countless stories of people melting their siding because they had their grill too close to their house! Can a Deck Include a TV or Entertainment Area? Are you tired of wasting a perfectly nice day in your basement watching the game? Why not bring the game outside? The key to an outdoor entertainment center is investing in equipment designed for the outside. You can’t just mount an indoor flat panel TV outside and expect it to work after the first rainfall! And, make sure that you are using outdoor-rated cables and mountings. Not only are these pieces of equipment designed to withstand weather, but outdoor TVs are brighter so that they can be enjoyed in the full sun. Can a Deck Hold a Gazebo, Pergola, or Pavilion? Gazebos, pergolas, and pavilions are a great way to provide shade and shelter on your deck, allowing you to enjoy your deck in all kinds of weather. However, these structures can also be heavy and should not simply be placed on top of an existing deck structure. Instead, you need to consider anchoring them directly. Luckily, if you already have a deck, you can add one of these structures without too many design changes. It may simply mean removing some railing and placing the structure adjacent to the existing deck. Furthermore, from an aesthetic standpoint, a gazebo in the center of your deck may look out of place. What Other Cool Things Can I Add to My Deck? The best thing about decks is their versatility. There are countless other things you can add to your deck! You can build a deck around a beloved tree in your yard, allowing you to expand your outdoor space without losing that tire swing or valuable shade. You can install a vertical garden in planter boxes. This pairs perfectly with an outdoor kitchen, as you can add fresh produce to the menu! You can install a chalkboard, allowing kids to draw and create outside. Speaking of kids, you could install a sandbox, giving your family another place to play during the warmer months. Maybe your family loves lawn games. Why not install a horseshoe or corn hole court? Remember, you know your family and their interests better than anyone, so don’t be afraid to dream about the perfect deck for you, even if it’s a bit quirky. What Should I Avoid Adding to My Deck? While you should feel free to dream big, there are a few items that should be left off of your deck, primarily for safety reasons. Kids love the idea of a trampoline, but they are a big safety issue, especially on a deck. If a child were to fall off, or if the trampoline were to shift, a deck could cause serious injury. Additionally, play equipment such as slides and monkey bars should be left in the yard. The softer ground will ensure that kids can enjoy these structures safely. You also want to avoid certain types of heaters, especially those that are not designed to be used outside or on wood surfaces. These can pose a fire hazard. 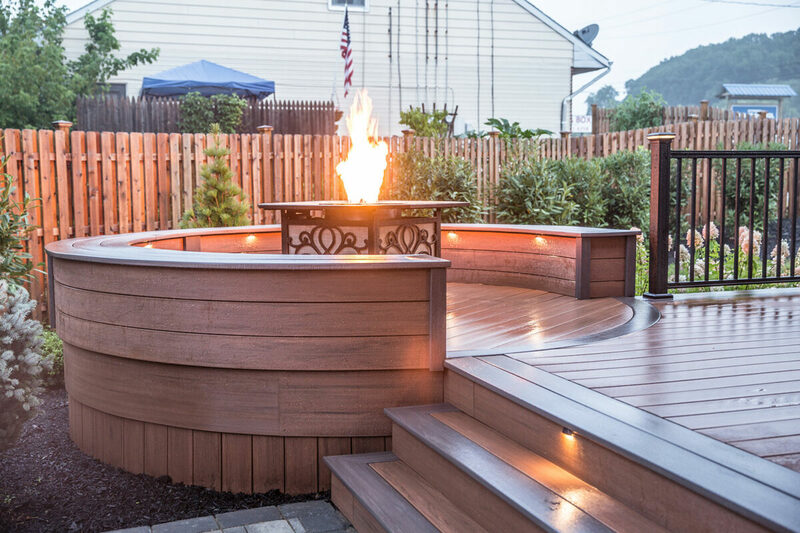 If you are looking to add your dream features to an existing deck or if you want to build a whole new deck from the ground up, contact us at Integrous. 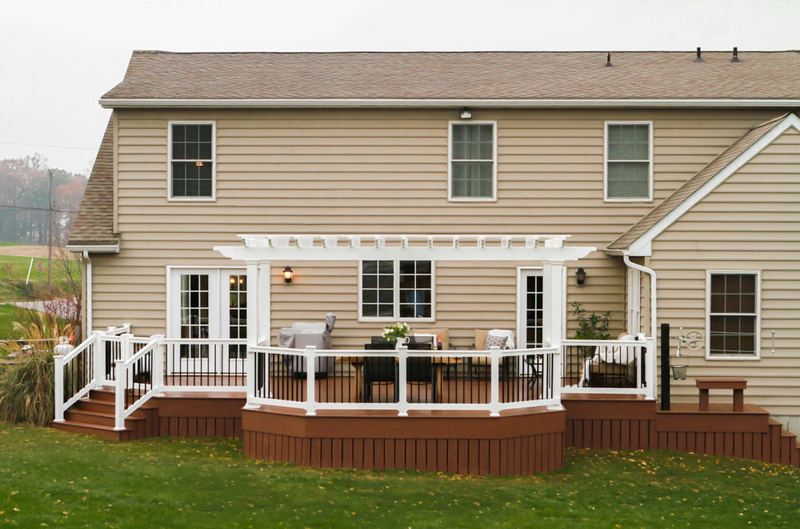 We are Pennsylvania’s premier deck and fencing experts. We have the experience and the personal touch to help make your dream deck into a reality!